Named one of the best novels of the year by Time Magazine, Publishers Weekly, Library Journal, and Locus, and winner of the Nebula and Hugo Awards for Best Novel, The Windup Girl is now available in Trade Paperback. "It's ridiculous how good this book is... Bacigalupi's vision is almost as rich and shocking as William Gibson's vision was in 1984... I hope he writes 10 sequels." "Bacigalupi is a worthy successor to William Gibson: This is cyberpunk without computers." What Happens when calories become currency? What happens when bio-terrorism becomes a tool for corporate profits, when said bio-terrorism's genetic drift forces mankind to the cusp of post-human evolution? Award-winning author Paolo Bacigalupi delivers one of the most highly acclaimed science fiction novels of the twenty-first century. Or purchase The Windup Girl as a DRM-free e-book in the format of your choice through WebScription.net. Hardcover - 376 pages - $24.95 - Out of stock. 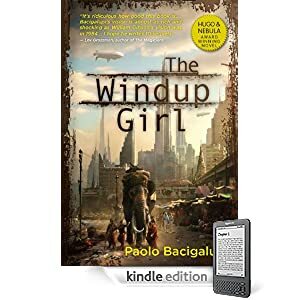 Errata: Due to a production error, Paolo Bacigalupi's acknowledgments was omitted from the first edition hardcover of THE WINDUP GIRL. We regret this error. A PDF of this acknowledgments page can be downloaded here.